Who loves to save money? I know I do. I also love making my own beauty products which can be somewhat complicated but there is nothing easier than making your own DIY Foaming Soap with this simple recipe. Rather than spending $4 or $5 for each bottle of soap at the grocery store, this basic recipe costs as little as 15 cents per bottle. The really cool thing is that you can personalize the scent and color your foam soap to match your mood or decor of your bathroom. Feeling floral? Add rose water or lavender oil for a fresh spring scent. In the fall, you may want to try a heavier, musky scented soap such as sandalwood or eucalyptus. To change the color, simply add a few drops of soap making dyes. (I don’t recommend food dyes as they may stain your towels). Did you see my other beauty recipes? For a large dispenser like mine, place 3 Tablespoons of liquid soap in the dispenser. Fill with very warm water and gently shake to dissolve the soap. Add a few drops of soap color and essential oil, if using. Hint: Always fill your bottle with the warm water before adding the soap. If you add the soap first, it will foam up as you add the water. 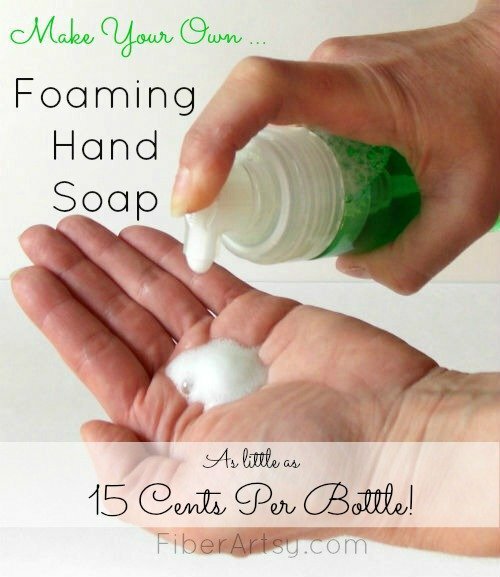 Save even more money on your soap: I bought my foaming soap bottle at Dollar Tree for duh … a dollar. That bottle has lasted for at least six months now. The nice thing is they come in different colors so even if you don’t add soap dye, you still have a somewhat pretty soap bottle on your vanity. THAT’S IT! Really! That is all there is to it. You have your very own foaming hand soap. Have some fun with the fragrance! Two of my favorites are Peppermint and Lavender Essential Oil . Do you have a favorite beauty recipe? Please share in the comments below! 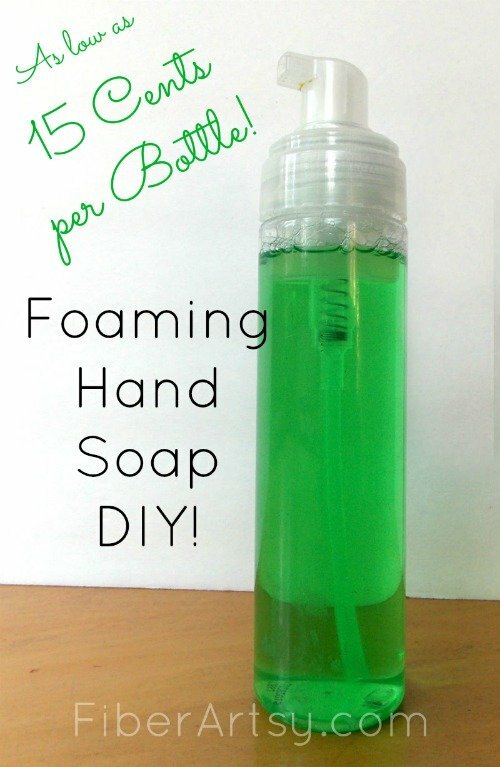 I make my own foaming handsoap too! I use castile soap (Dr. Woods Peppermint) and water. It is soap without chemicals. (I am careful about chemicals because I found that I was able to overcome health problems by working on detox.) So far my recycled soap foam pump has lasted and lasted. Thank you for sharing! Cool! I much prefer natural ingredients, too so I’ll give the castile soap a try. Thanks for the suggestion! Cool. Thanks for joining the Small victories Linkup. Please join again. How neat! I want to make me some. 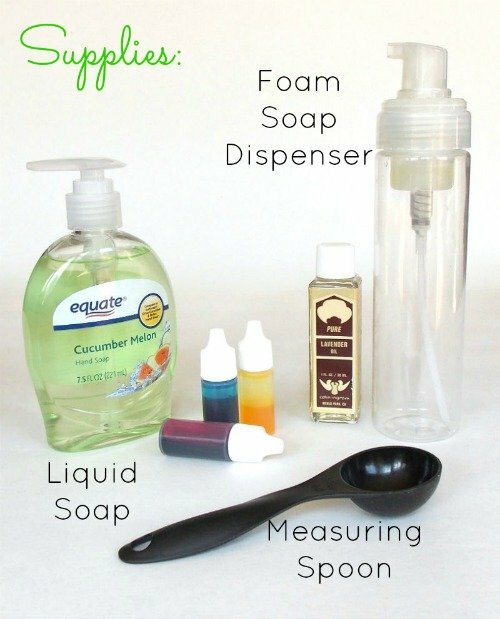 I will have to look for a dispenser like that, and I have some castile soap I will use that. Thanks for sharing! Pinning! Thank you for reminding me that I want to get back to making hair and skin cleansers this summer! Thank you, Michelle. I prefer to use natural ingredients so I’ve been playing around with a more ‘green’ foaming soap recipe. Stay tuned! Great post. I pinned it and will definitely be trying it! I don’t have a favorite beauty recipe, but this sure does look nice. I love foam hand soap over every other kind out there. Thanks Crystal! I’m playing around with an organic version, too. They’re not necessary but fun to play with! I need to know the ratio of water per 3 oz of soap??? Help! Thanks. If my math is right, it should be about 5 cups of water to 3 oz of soap, Sandra. Thanks for stopping by!